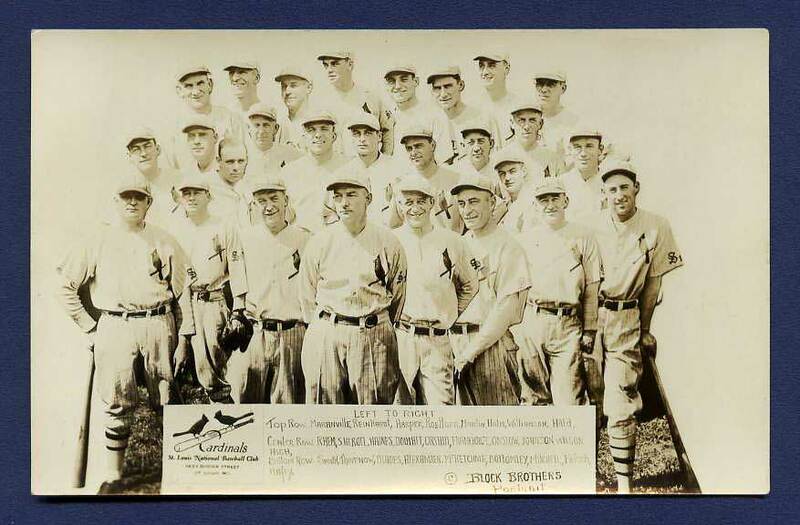 The Real-Photo cards featured in this gallery depict a range of subjects, from Major Leaguers to Semi-Pro and MInor League teams to town and sandlot teams. Almost all of these cards were issued privately by unknown photographers or publishers. Credits are rare exceptions. The real fun here is in the identification challenges presented. Almost all of these postcards are only partially identified or not at all. VintageBall visitors are encouraged to fill in the blanks. If you have any pertinent info, please click one of these icons -- -- that are spread throughout this gallery, and fill in the form to share your knowledge. As always, you will have the option to be credited for your submissions. We encourage users to send photos of their postcards in need of ID help, by emailing us at [email protected]. 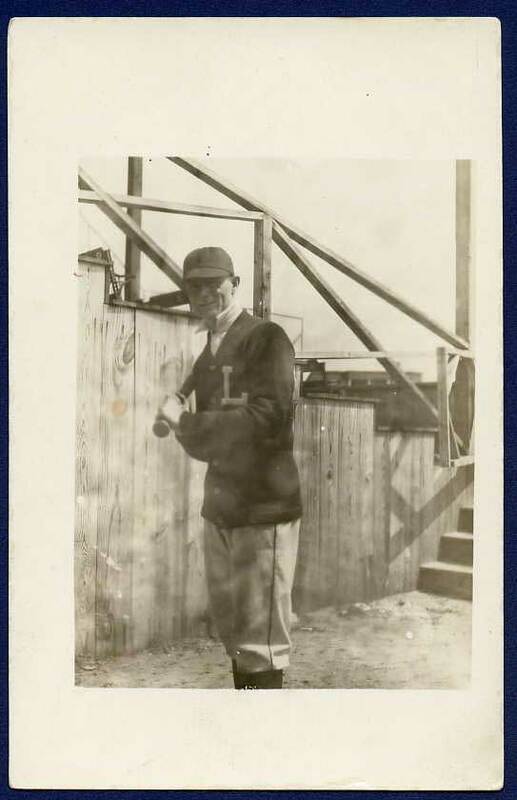 Postmarked in 1908, this card features Harry 'Hal' Krause who pitched for the Philadelphia A's for five years , winning a career high 18 games in 1909, when he led the league with an ERA of 1.39. 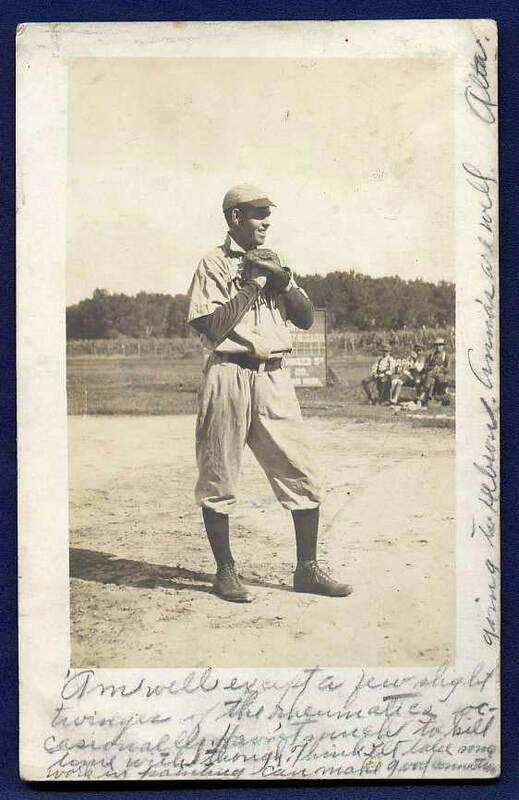 This 1908 card shows him pitching for a semi-pro team, most likely in Nebraska, from whence it was mailed. 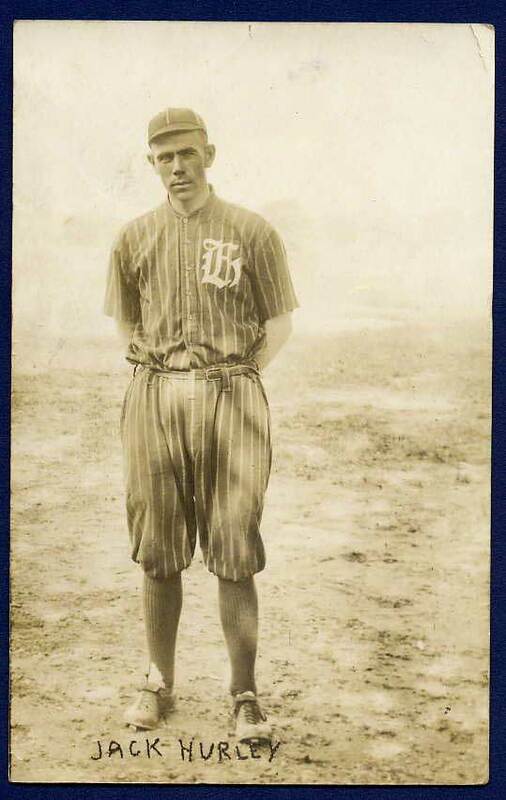 Krause appears on many baseball cards of the era. More info on this Nebrasaka team is needed. 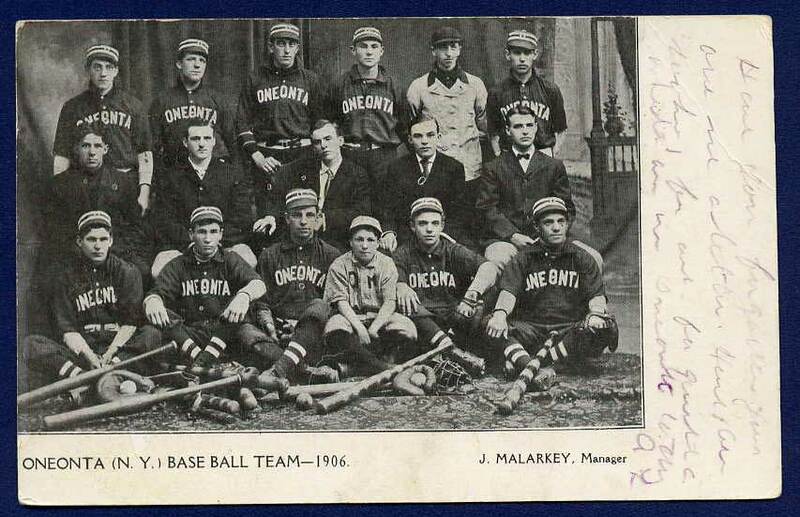 Early undivided back postcard of Oneonta, NY team, captioned 1906 with manager J. Malarkey named. Sent by one of the players to a friend. Not technically a Real-Photo card, but similarly "homemade." 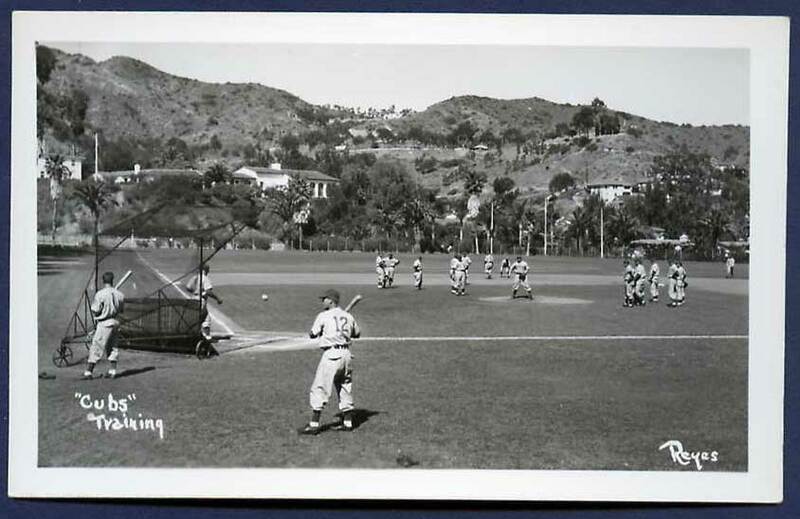 Two intriguing cards featuring the Chicago Cubs at Spring Training in San Catalina, California. Both are signed by a photograher "Reyes." The postacrd on top is dated either "1910" or 1929" -- more likely the latter, considering the photographic paper mas made by AZO from 1926 into the 1940s (identified by the squares in the corner of the stampboxes) . The card showcased on the bottom was issued on EKC photo paper, which was made from 1939 to 1950. 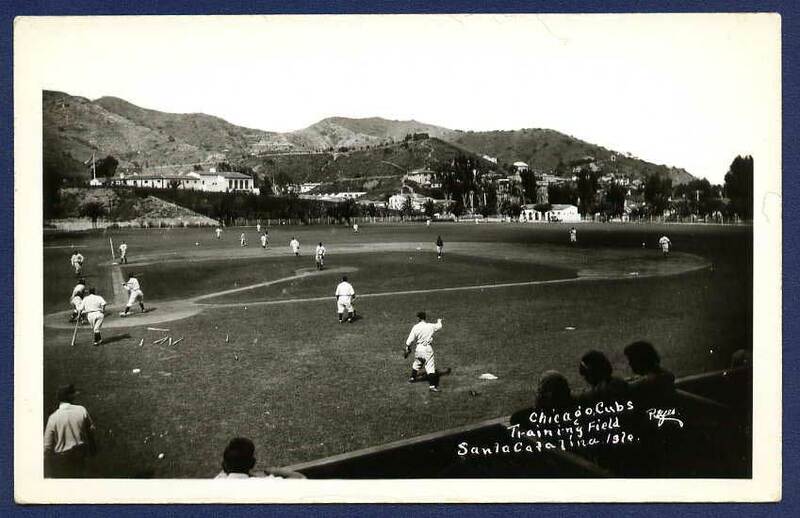 For full-color postcards of the Cubs at Catalina, visit our Ballpark Postcard Gallery. 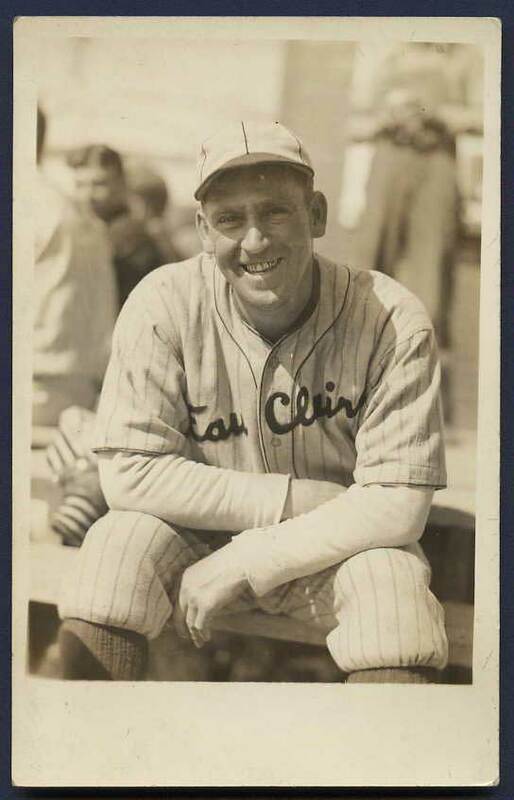 Issued in the 1930s, this card depicts former White Sox All-Star centerfielder Johnny mostil, when he was managing for Eau Clai, Wisconsin in the Northern Baseball League. 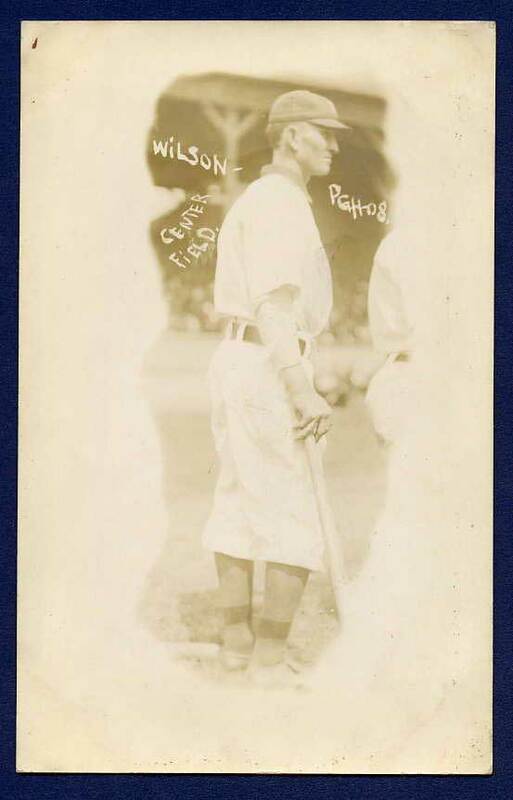 Mostil played for the Sox form 1918 to 1929, leading the league in 1925 in runs, stolen bases, bases on balls and fielding. 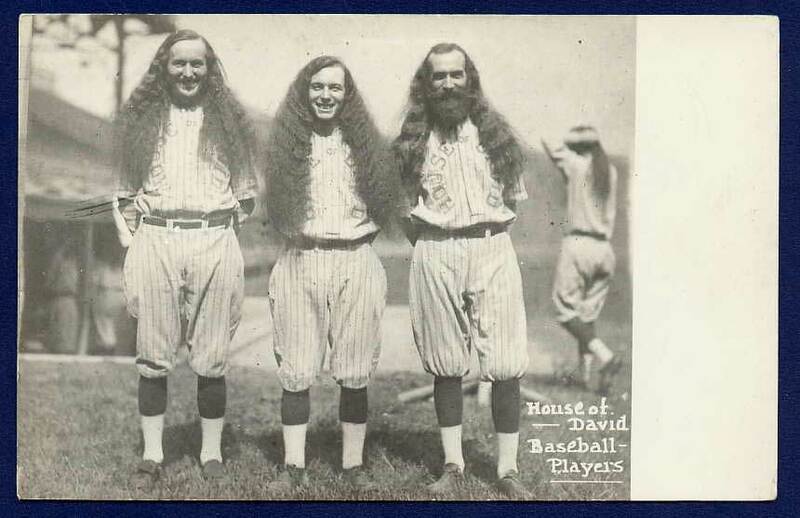 This postcard was issued on AZO paper. 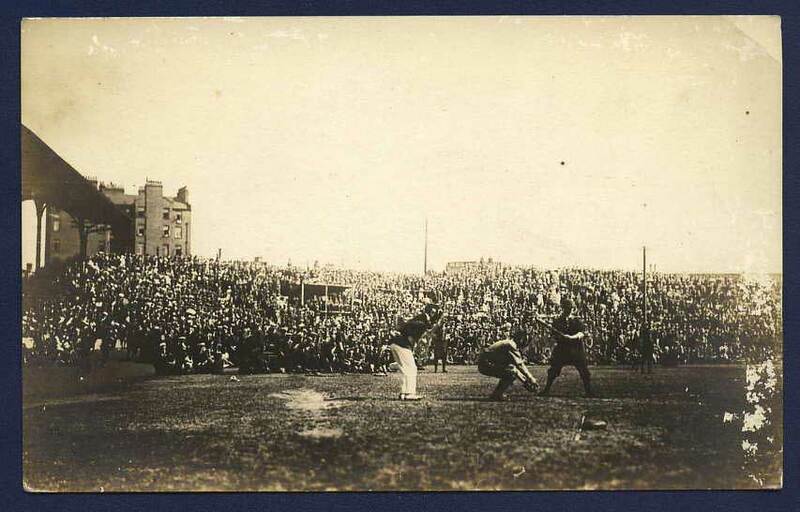 Said to depict a c.1910 (or earlier) exhibition game between the Philadelphia Athletics and the Mt. Union, PA team. This photo was taken at Mt. 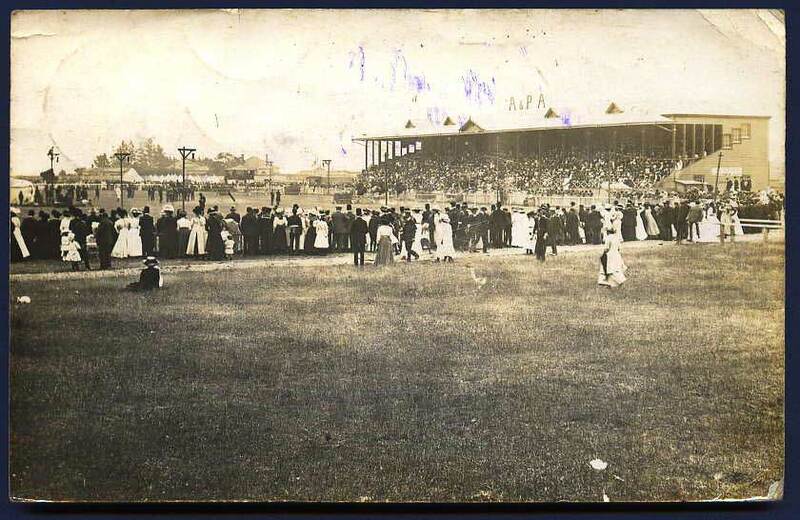 Union's Victoria Park. 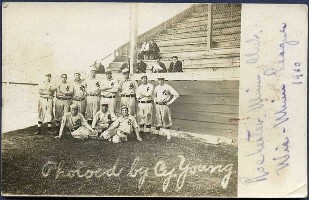 More info is needed on the veracity of the A's identification, noted in pencil on the reverse. 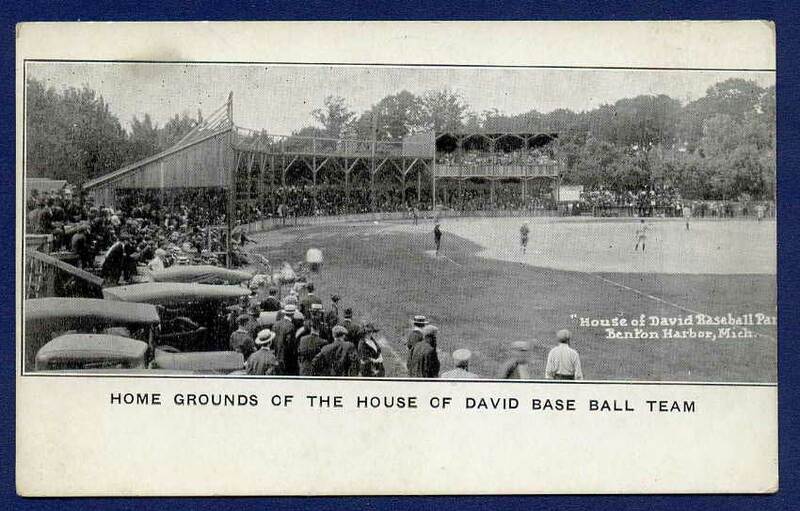 Information is definitely welcomed on this postcard, which features an in-action scene of either a major league, minor league or even a military game. One older observer suggests the batter resembles Johnny Evers in stance, but this is likely wishful thinking. Unlike a printed postcard, the image on a "Real-Photo" card is not made up of print dots, it is solid like other actual photos. The key to determining a "Real-Photo" card's age is the photographic paper manufacturer. Different brands, such as AZO, CYKO, ARTURA, VELOX and others all feature identifying marks in a card's stampbox, signifying when the paper was issued. A complete "cheat sheet" and manufacturer stamp box photos are available at this external link: http://www.playle.com/postcards.html#realphoto. 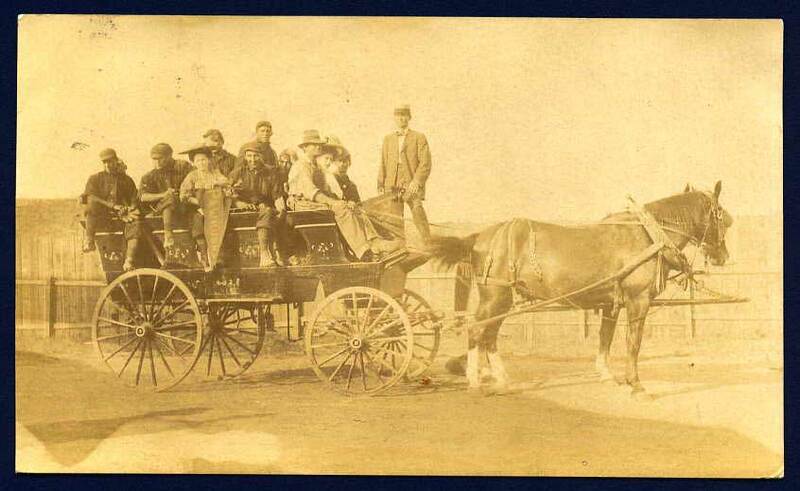 1908 card featuring team members in a horse-drawn wagon. 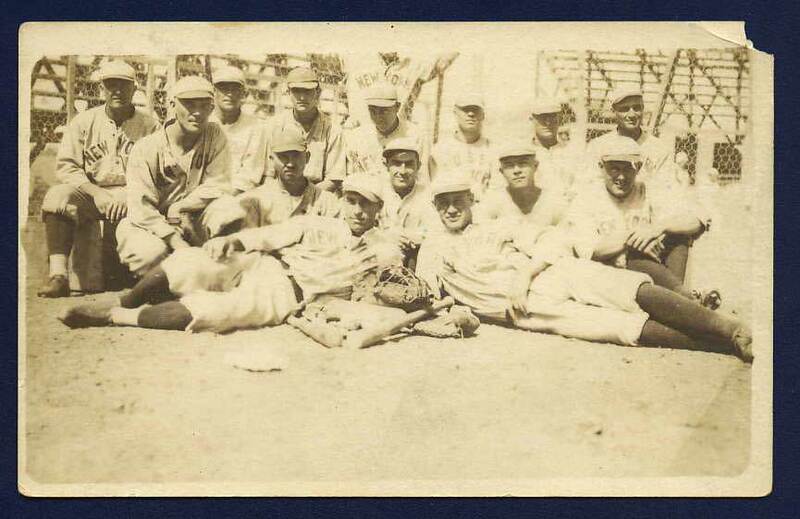 Some have speculated this was a Spring Training postcard, although the banner held by a rooter suggests this was a local Arizona team. 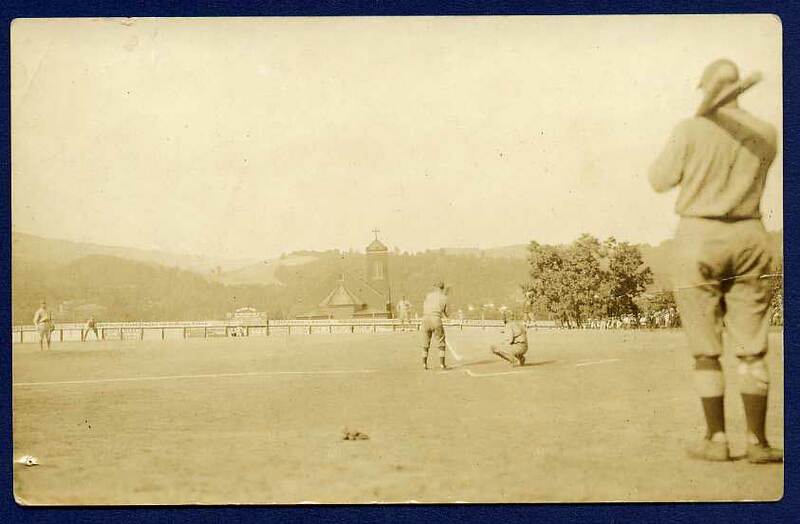 Another postcard from 1908, this one was mailed form Reading, PA. Pennsylvania was a hotbed of semipro and town teams throughout the warly half of the centruy. 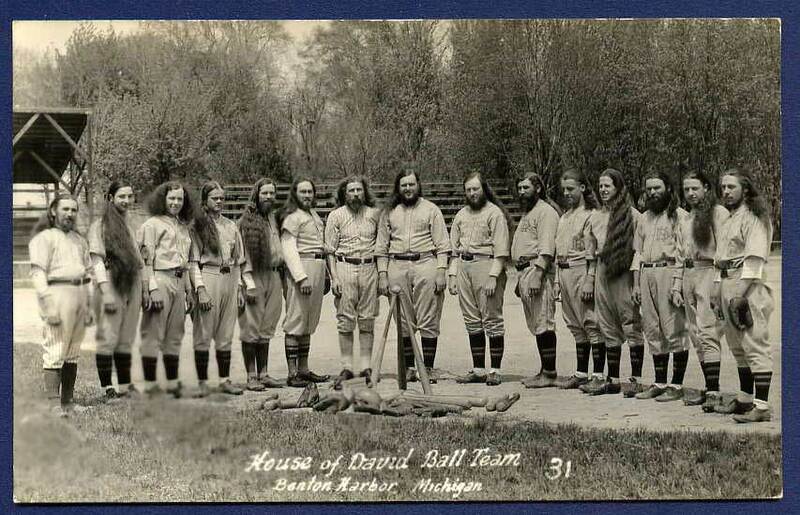 Clearly a minor league team, based on uniforms and ballpark stands. 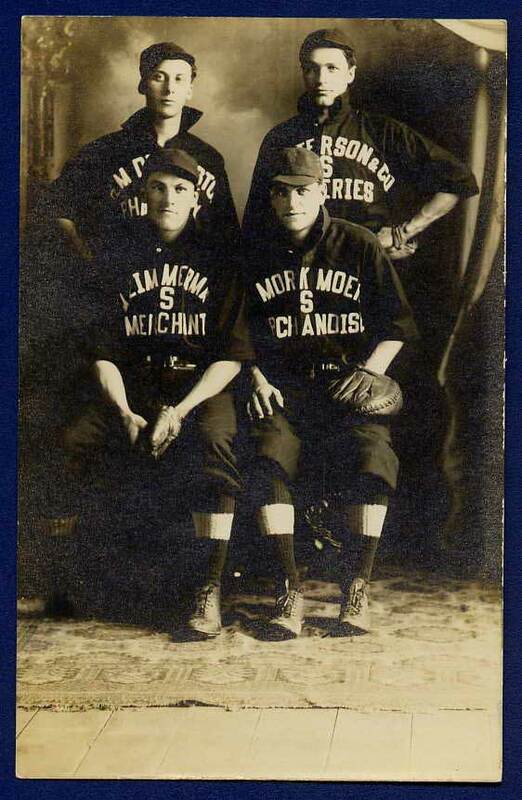 This card is from 1910 and was noted by previous owner as depicting the Milwaukee team. Information definitely needed on team origin. 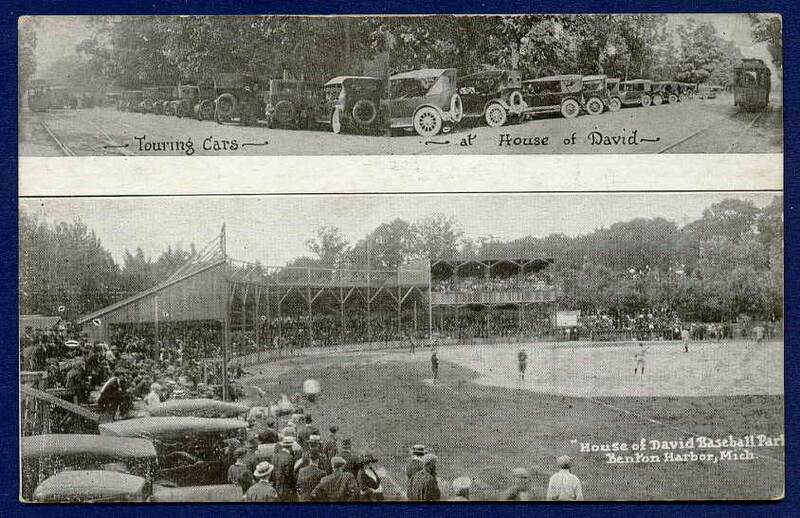 These two cards most likely depict Maryland's minor league Hagerstown Terriers of 1917.
lead the league with 125 hits and an impressive .385 batting average. 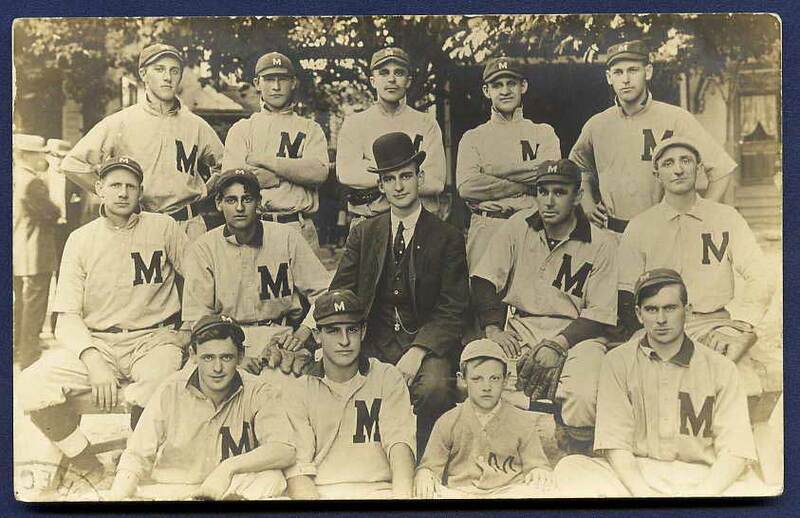 According to "The Encyclopedia of Minor League Baseball," 1917 was the only year he was associated with this team. 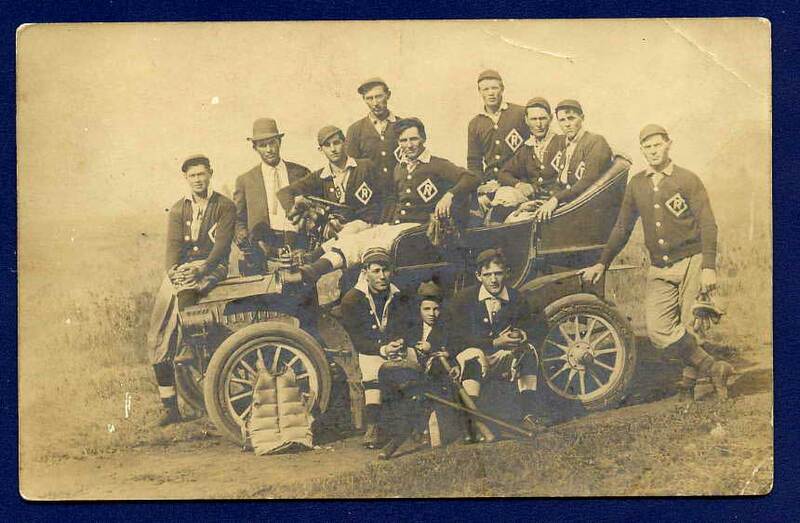 Circa 1904-1918 (based on the type of AZO photo paper), the only thing we know about this team is that they were able to afford uniforms, warm-up sweaters...and a car. 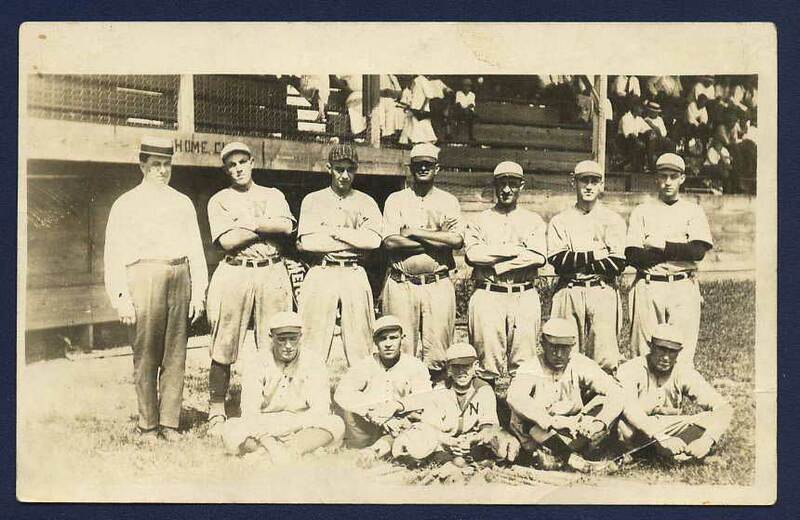 Postmarked 1918 this card represents another unideintified semi-pro team posed in front of partially-filled ballpark stands. 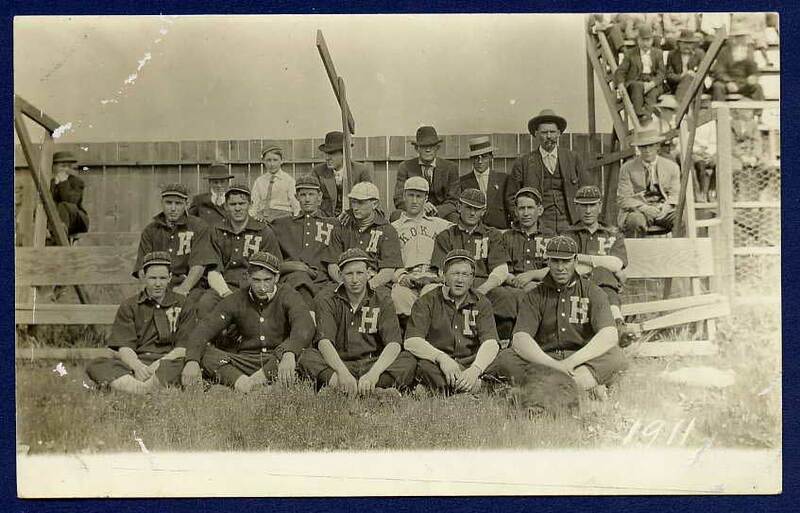 This postcard features the Hillsboro, OK team and was issued between 1904 and 1918. Another team pose in front of local fans in the stands. 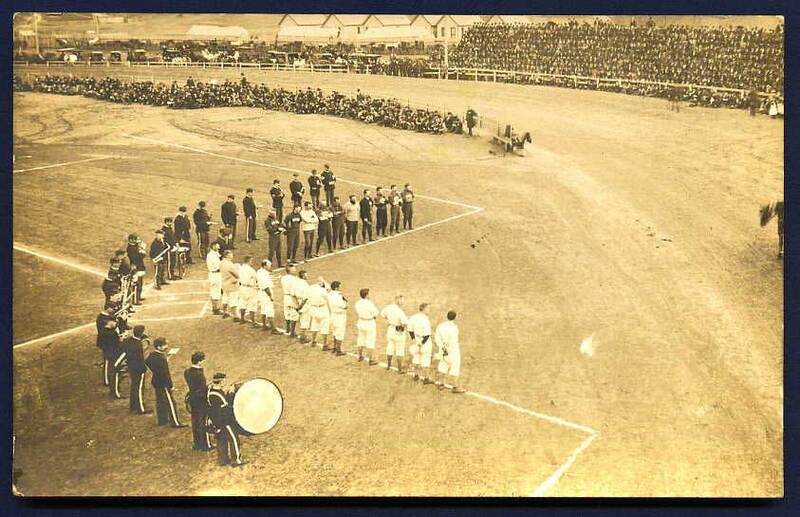 Clearly a professional gathering, this card depicts opening day ceremonies at an unknown locale. 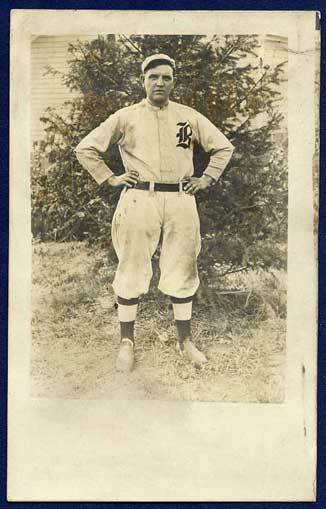 Likely a minor league, gatheinrg, this card was issued between 1904 and 1918, identifiable by the photo paper. 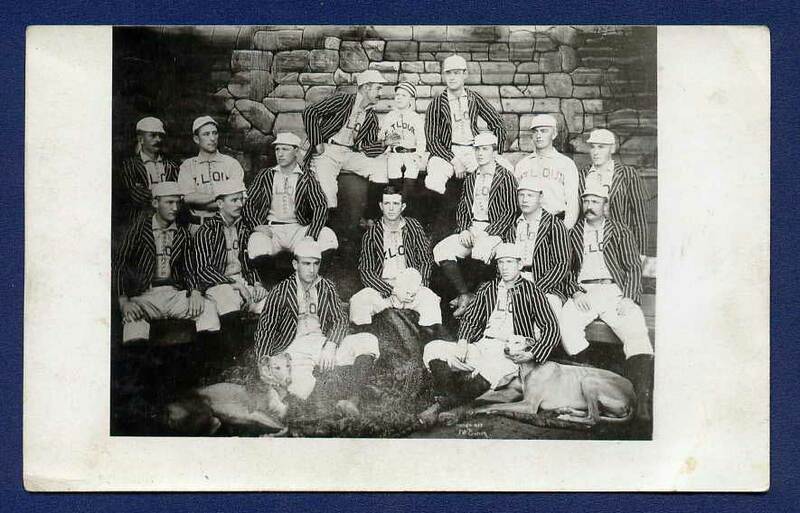 Terrific image of the baseball team from the USS New York. Many ships boasted their own teams and became popular subjects of Real-Photo postcards. 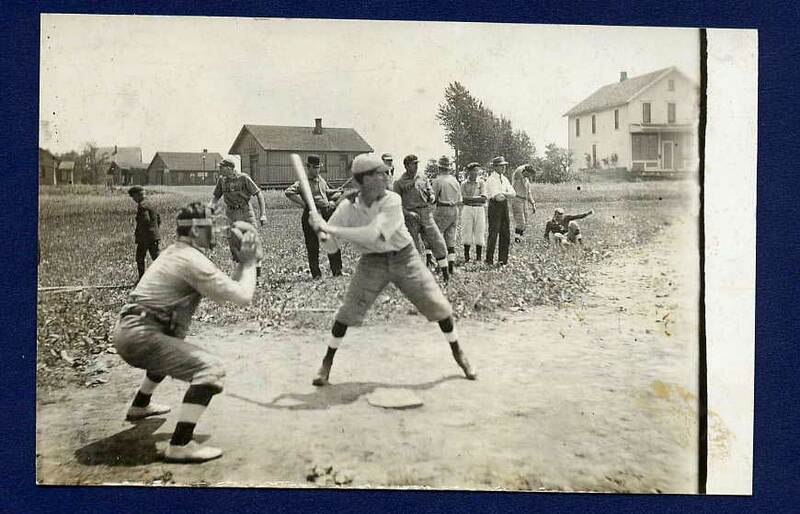 Minor League or semi-pro image circa 1904-1920, with a background reminsicent of select T206 and caramel baseball cards. Unkown player and team. This two-card "set" features the photographer imprint literally stamped into the cardboard itself on the card shown at bottom, left. 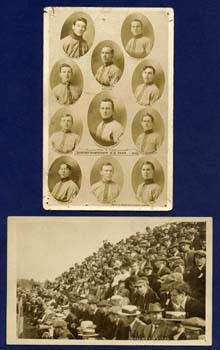 The first card showcases each player on the Sanford Independent team, while the latter captures the "crowd" at the New Ball park on Memorial Day. A crowd of 1,200 watched Sanford defeat Springvale by a score of 3-0, accroding to the notation on the reverse. The photograoher on both post cards is credited as Philpot Studio, while the Cyko paper on the reverse of the second card indicates these cards were manufactured between 1904 and the 1920s. Click on the cards to enlarge to see the individual team member names. 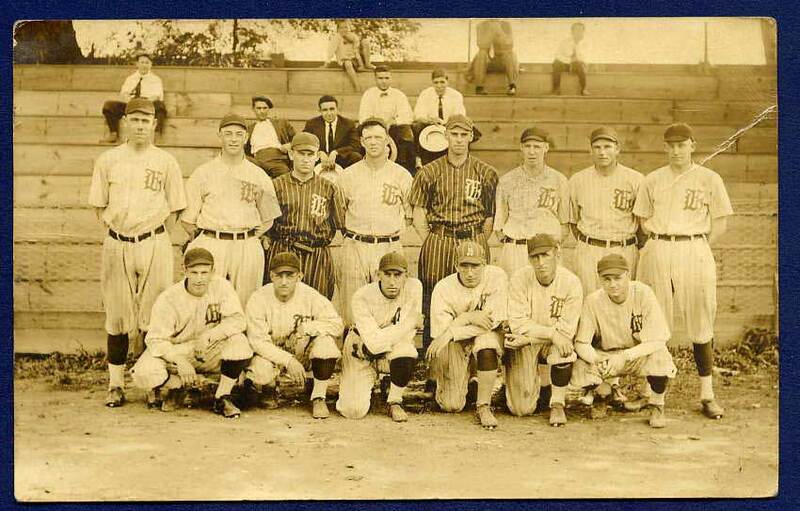 Any info on this team or the photographer is much appreciated. Issued on paper manufactured by Artura between 1910 and 1924, these pposed players played for a team sponsored by a local merchant. 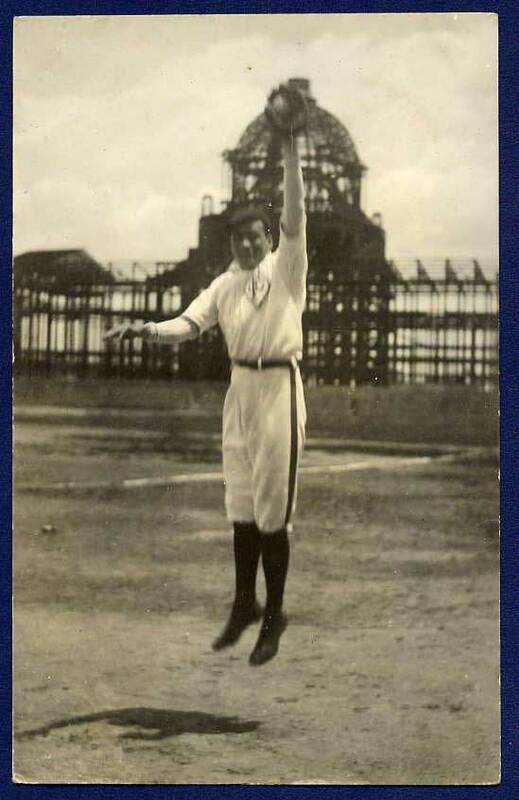 Extremely early undivided back postcard depicting a youngish player in full regalia. Very odd card that resembles pre-1900 private mailing cards. It is longer than traditional cards and has an undivided back. 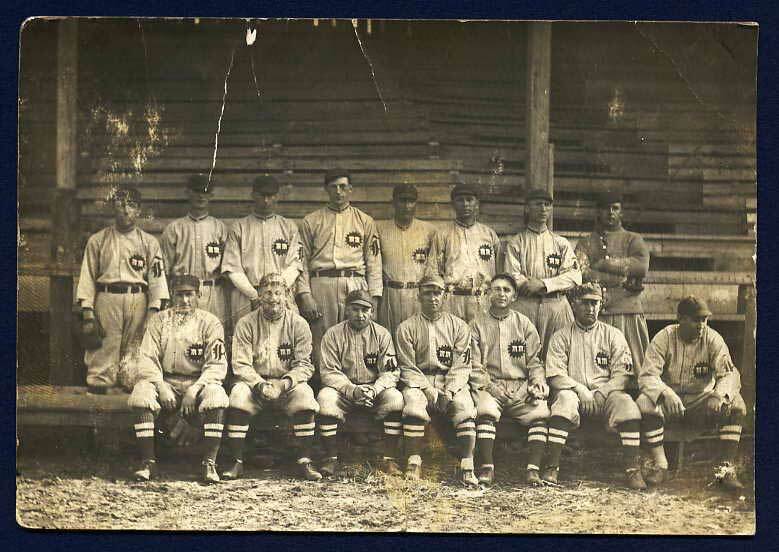 However, the players are set against a backdrop that includes early autos, setting the date at around 1908. 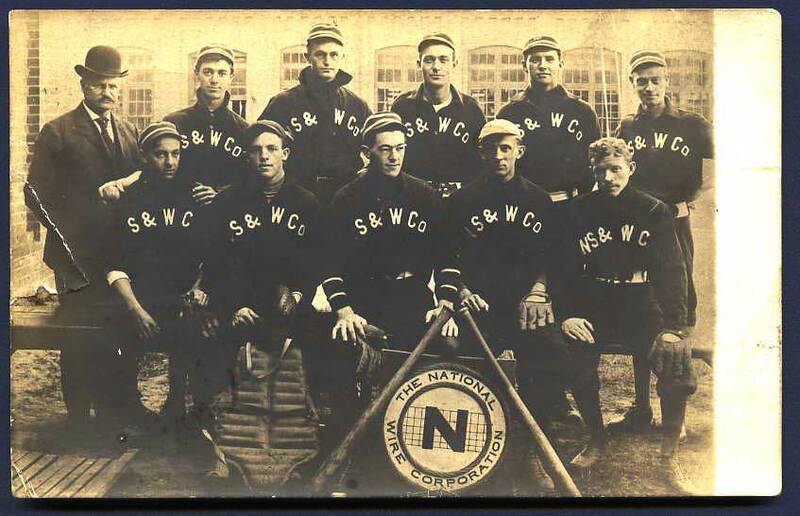 Early undivided back card form 1906 depicting a classic factory team image -- the National Wire Corporation baseball team, complete with company logo, equipment and manager. 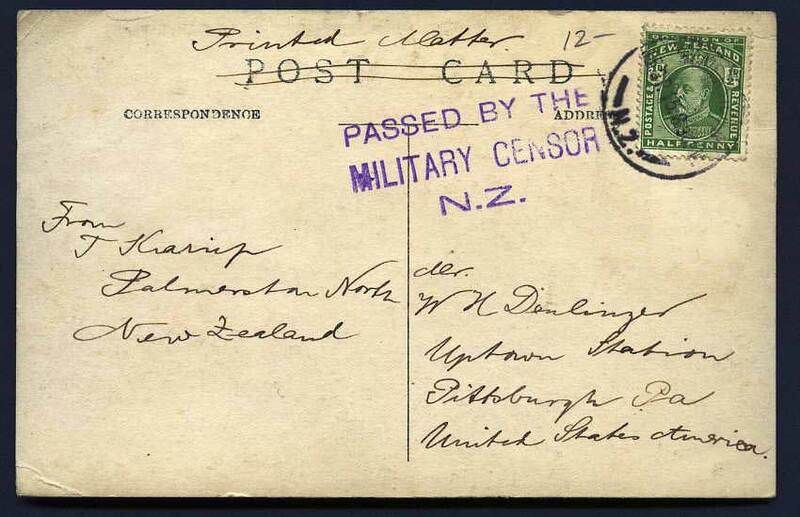 Another strange specimen: a postcard depicting a match, sent from New Zealand to the U.S. Intriguingly, the reverse is marked as having passed a military censor and been cleared to be posted. Also interesting, the card was sent categorized not as a postcard but as a letter. Just where this photo was taken, however, is a mystery...although likely shot in New Zealand. 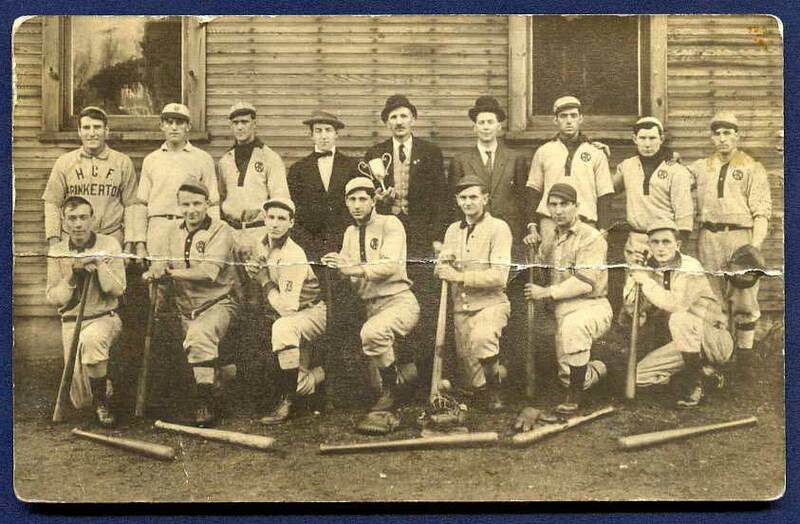 c. 1912 card showing team sponsored by the Henry Clay Frick Coal and Coke Company. 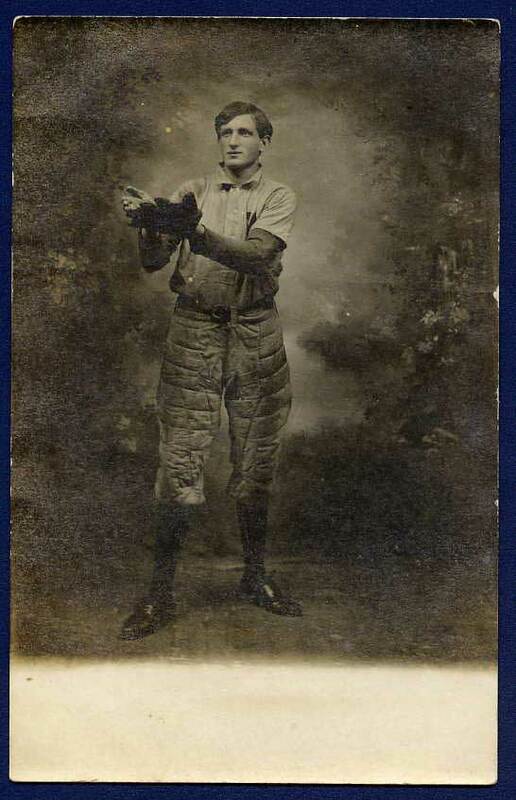 Reverse singles out a player named Henry Seighman. 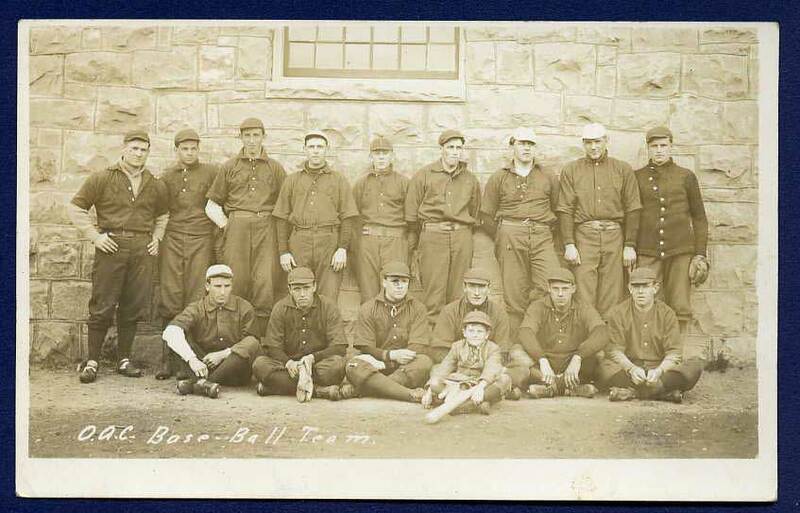 The team was made up of miners from around the village of Westmoreland Co., PA. 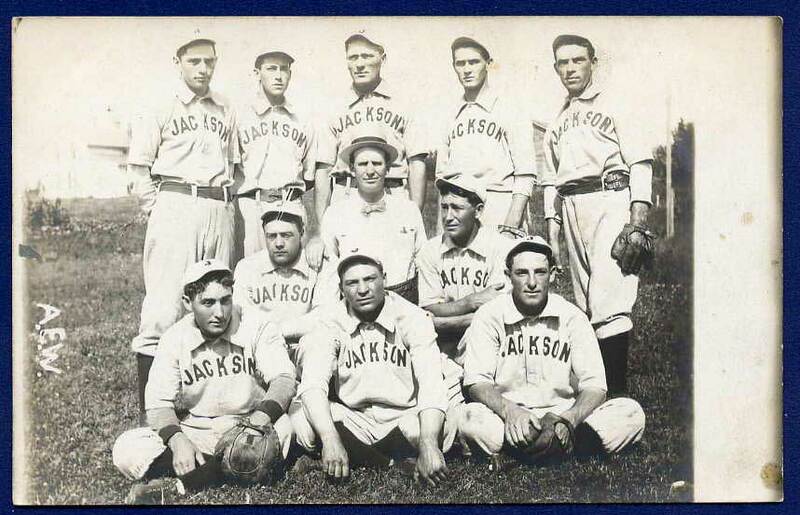 This team from Jackson (Wyoming?) wins for the award for a player most resembling a young Nap Lajoie. Check out the young man in the lower left. (O.A.C. ), according to collector Dan Yaw. In 1961, the school name was changed to its current name: Oregon State University. Backed with common AZO photographic paper. 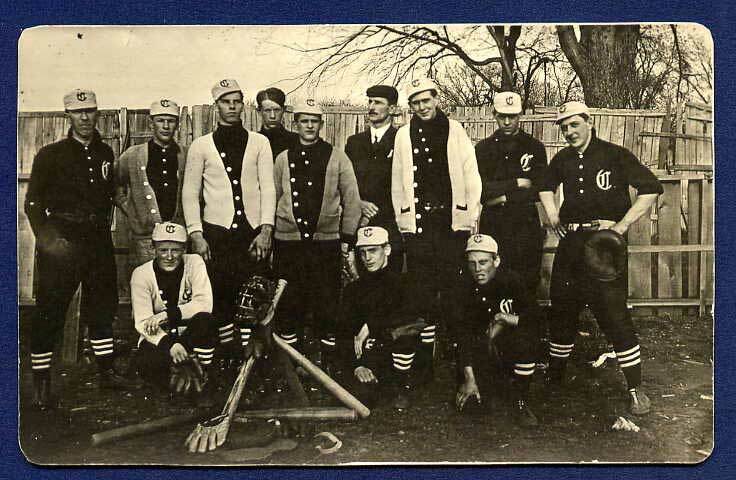 A jaunty bunch from 1907-14 era, clearly proud of the surfeit of equipment at their feet and their natty uniforms. Another enigma -- this team is posing with a uniformed soldier (?) possibly a WWI-era particpant. The two-tone caps also make for a great image. A well-scrubbed town team, circa 1904-1920s, with an SA insignia. Possibly San Antonio? Also, a mixed bunch in terms of age, with a couple of younger players in the lower right next to mascot or batboy. A classic sandlot in-action image, of ever there was one. Velox paper from 1907-1914 on the reverse backing. 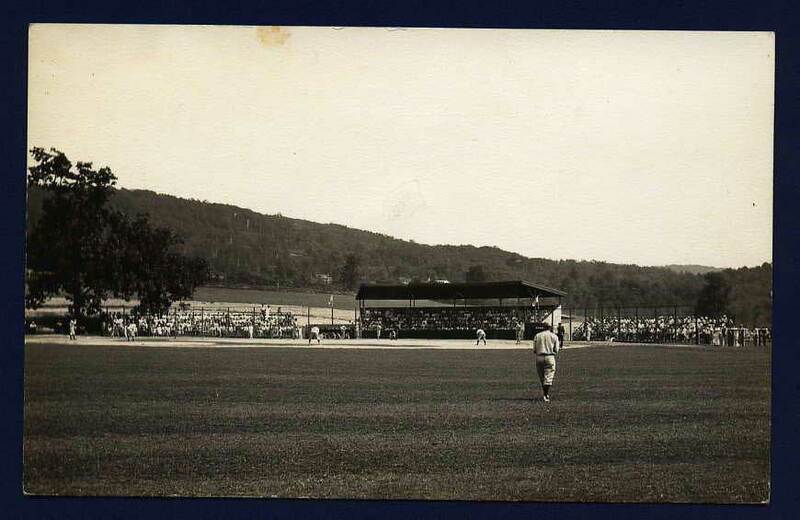 Circa 1904-1918 scene, possibly a minor league or semi-pro team, due to the structured ballpark stand in the background behind home plate. Potentially a town or factory team, as well. 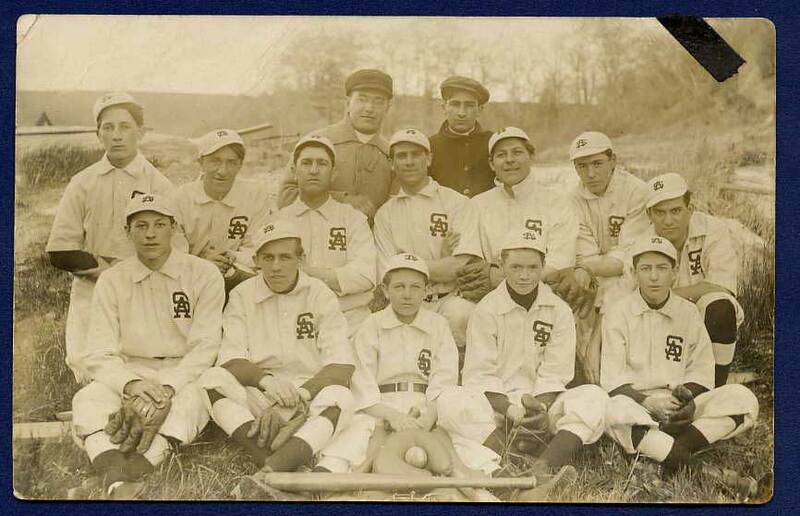 An untapped facet of Cy Young's Hall of fame career emerged in 1910, when he photographed the Wisconsin-Minnesota League's Rochester, Minnesota baseball team for the Real-Photo postcard featured on the right. Click on the card to enlarge the fruit of Cy's "alternative" career choice. 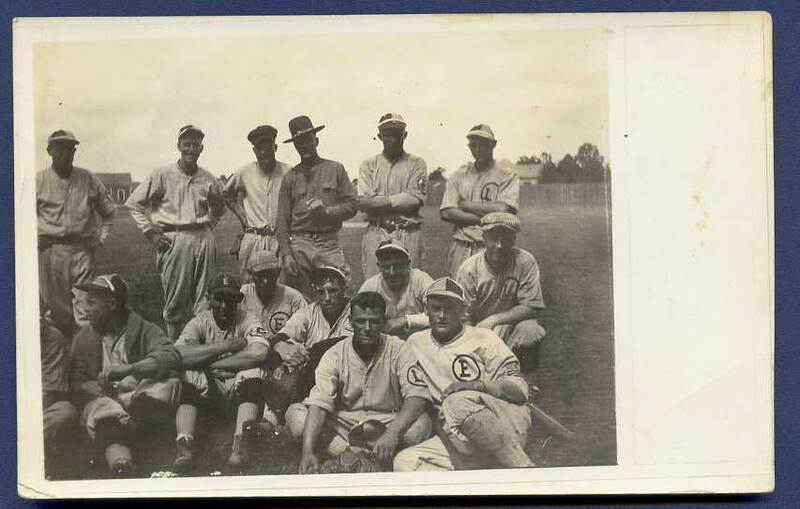 This card was discovered in the photo album of a Winnipeg, Manitoba family whose son played ball in the U.S. 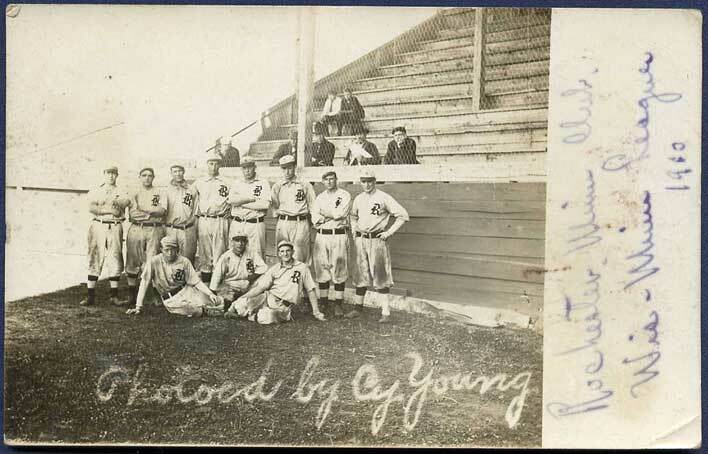 Along with this strange "Photoed by Cy Young" card, the album yielded numeorus shots of one of the Rochester team members, named Charles Bell or Charles Bell Blew, and his various teams. Some of these other Real-Photo postcards and postcard-sized photos can be viewed by clicking on the card of Charles, featured on the lower right. Any other information on the mystery of Cy as photographer, and the Blew family, is appreaciated!